After the Mozart CD debacle, we performed a little experiment. We played several types of music for Marlie to see which she preferred. She likes reggae, pop, R&B, and country music (like her mommy) and she likes jazz, electronica, and hip-hop (like her daddy). But she cried at the choral intro to the song "Everybody's Free" from the Romeo + Juliet soundtrack and when I played the lullabies for baby CD her godmother sent. The results indicate that Marlie does not like classical, operatic, or chamber music. I hope this is just a phase because we'd love to take her to the symphony when she's older. I'm loving my camera as evidenced by the barrage of photos appearing on the blog this week! Marlie is going to appear in some designs for Jael's greeting card portfolio. I guess that makes her a professional model, LOL! We product tested 10 pocket cloth diaper brands this week for my friend who is opening a store. Let's just say I wasn't impressed enough to switch from our diapering system of prefolds and covers. The constant stuffing of the pockets with inserts nearly drove me mad! Marlie continues to drool and is gumming like crazy. I predict she will cut her first to oth at 4 months. She is also taking an interest in the illustrations on the pages of the books we read to her. Oh, and she loves playing with her stuffed bunny. It's a puppet that has mirrored feet and different textured hands and ears to help babies develop their sense of touch. Muy, muy cute! Our costumes were a hit at the Lil' Pumpkin Parade at Damon's office. 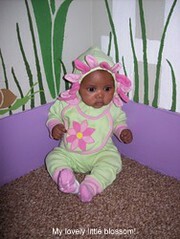 We went as a gardener and flower. I thought I was being really original and creative, so I entered the (un)Haunted Halloween Photo Contest over at parenting BY dummies. Please vote for us! We have some stiff competition! She is SO so cute! I am glad you are putting lots of pictures in your posts! Pictures make every post better : ) and with an adorable baby like that, how can you resist? you guys looked great! that is the cutest little flower i've ever seen!! Just to make the goodsportmanship model a little easier,I'm going to go vote for you guys right now! The cutest little flower ever! Came over from SITS!! Happy Halloween! I think it is amazing that babies can be so particular, so young about music. I think my ovaries just pinged. That little flower is ADORABLE! My son loved music- all kinds- it would capture his attention immediately. What a precious idea! Just stopping by from SITS. Have a great week! Oh my gosh, you two are way too pretty! Both of you...so pretty and way too cute for words!! Lovely, Lovely, Lovely!!! That is beyond adorable! What fun memories you're making! What an adorable little flower! I hope you had a wonderful Halloween! Visiting from SITS!